A kitty litter that works well, is well-tolerated by your feline friend, and doesn’t cost you a ton of money, time, and energy. What Are The Benefits Of Crystal Cat Litter? High absorption and odor protection. 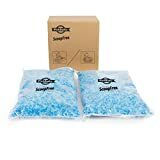 Are There Any Concerns to Using Crystal Cat Litter? Cats often don’t find it comfortable. Not recommended for multiple cats. Can be dangerous if eaten. First introduced to the market in the late 1990s, crystal cat litter is made primarily of silica gel. Silica gel is in those little “dessicant—do not eat” cachets that come in packages of products (like medications, vitamins, and shoes) which can be become damaged if they come in contact with moisture. The gel is made of three ingredients: silica dioxide sand, oxygen, and water. And it turns out that it’s exceptional at absorbing moisture—tiny pores in the gel allow it to absorb up to 40 times its weight in liquid! As kitty litter, silica gel literally looks like little blue or white crystals. You simply pour this into your litter box and let it do it’s thing. Here is a great video from “BrainStuff – HowStuffWorks” explaining exactly how silica gel in general works. Cat litter crystals may look a little strange, and they’re certainly unique from your typical litter. But there are plenty of pet parents who swear by them. The silica gel won’t stick to your cats paws and coat as easily as some other types of litter does. Many brands of crystal litter also pledge minimal to no tracking—so less of it comes out of the box and more of it stays in the box where it can do its job! For any household that has cats or humans with respiratory concerns (like allergies), a crystal litter product can be a huge help. It’s virtually dust-free, so it won’t spew up particles into the air when your cat goes in to scratch away and do her duties. Here’s how crystal litter works: the silica granules absorb liquid waste completely (you can tell it’s working when they go from blue to yellow). All you have to do is remove the solid waste and stir around the remaining crystals to avoid areas of over-saturation. And some silica kitty litters are even safe to flush down the toilet for extra-easy clean up. Remember how we said that silica can absorb up to 40 times its weight in liquid? Yeah. That’s a lot of urine. Crystal cat litter soaks up liquid exceptionally well—giving you a minimal to no mess box. It also traps odors effectively, too (no more faint whiffs of cat urine and ammonia in the air). For some animals with sensitivities, crystal cat litter can be less irritating on their paw pads and skin. And if YOU have sensitive skin, then these crystals may be easier for you to handle…although you won’t have to handle it too often (see next point). The main benefit of crystal litter is that it requires changing and cleaning far less often than traditional litter. In fact, most quality crystal litters will last up to 1 month in a single-cat home! You can also usually get away with using far less crystal litter than traditional litter—allowing you to stretch out your dollars and avoid having to lift super heavy bags of litter, if that’s a concern for you. Now, before you go completely revamping your litter box, you should keep in mind a few precautions when it comes to kitty crystals. These may or may not apply to you and your household, but it’s worth being aware of them before purchasing. Litter crystals are harder than other types of litter granules. Because they’re hard and prickly, this can feel uncomfortable for some cats. The obvious problem with this is that if your cat finds its litter uncomfortable, she won’t want to use it! (Keep reading though—toward the end of this article, we’ll talk about a simple and easy way to introduce new litter to your pet so she’ll be more likely to get used to it). Don’t use it with declawed cats. Litter crystals can be especially challenging and uncomfortable for declawed cats. And since scratching is such a natural instinct, a declawed kitty will have a hard time scratching and moving around the crystals. If you have two or more cats or even just one large cat who produces a large amount of urine, crystal litter probably won’t be the right fit for you. That said, a lot of the pet owners who reviewed these crystal products say they can use it successfully with multiple cats—they just have to change out the litter a little more often. All other things being equal, silica crystal litter is almost always more pricey compared to traditional clumping or non-clumping litter brands. If you’re on a tight budget, this product may not be feasible for you. That said, a lot of it comes down to perceived value. Many cat owners who swear by crystal litter say that the extra price is well worth the amount of time and effort they save by not having to clean out the box as often. Silica gel on its own isn’t considered toxic. However, products containing silica gel (like some cat litters) often have added chemicals in it, such as cobalt chloride—which can be harmful if ingested. For this reason, using silica gel litter crystals with young kittens (who are notorious for putting things in their mouths) or any cat who tends to gnosh on things may not be the best idea. Silica gel granules can also cause gastrointestinal upset, like vomiting and diarrhea. And since the whole point of a good cat litter is to keep your furball comfortable and eliminate (rather than cause) messes, then you really need to make sure your cat won’t be tempted to eat it. 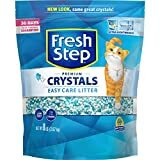 These kitty crystals from Fresh Step are great at stopping odors from seeping out of the litter box and into your house. And it has a nice fresh scent on top of it—many users say that house guests can’t even tell there’s a litter box in the home! While the product guarantees 30 days of freshness, most owners end up changing it after about 2 to 3 weeks (at least if they have two or more cats). For a non-clumping crystal cat litter, this product from PetSafe works wonders. It helps dry out solid waste in addition to absorbing urine, making clean up much easier and faster. It comes in two pre-portioned bags for easier handling, and pledges to be 99% dust-free and low-tracking. Additionally, PetSafe is an industry leader in pet behavior, containment, and lifestyle products, and they’re known for great customer service. This kitty crystal brand is growing in popularity recently. One of the main reasons is because it has slightly larger crystal granules, which makes them less likely to track and emit dust. Another factor in the plus column for a lot of owners is that it’s unscented (since scented products can be irritating to sensitive noses or skin). While among the more expensive of the bunch, the odor control really does appear to be best of the best, so the price may be right for you. Just the crystals, and nothing else! This crystal litter comes in two pre-measured bags to a box (4.4 lbs each), making it easy to pour and change out when necessary. Like other crystal brands, it pledges to over 5 times the odor control over traditional clay litters, and most reviewers seem to confirm this impressive feature. Rounding out our top five is this product from Ultra Pet—you can’t miss it, because it comes in a bright pink box! It features very soft and small crystal granules that are easy on cute little paws. Another bonus is that it doesn’t seem to form a sticky sludge on the bottom of the box like other litters tend to do. So, you’ve considered the pros and cons of crystal cat litter. You’ve read through the reviews and have selected the best one for your animal. Now you have to figure out how to actually introduce it to her! Place a new litter box filled with the new litter crystals next to your kitty’s current litter box. Put some of the new crystal granules in with your kitty’s old litter. This gives her a chance to get used to the new feel and texture. This may sound weird, but…let her old litter box stay dirty. Cats are clean by nature, and they like to go in a clean box. Keeping her old box dirty and keeping the new box clean should encourage her to start using the newer litter. Eventually, when your cat is regularly going to the new litter box, simply remove the old one. If you want, you can clean it out and save the box as a back up! Other ways to get the most out of your new crystal litter is to put it in a well-ventilated area, but not near an open window since this could expose the litter to moisture. Instead, try putting it near an air conditioner or a fan—this can keep the air around it drier. You also don’t want to put the litter in a room an area that tends to get humid like a bathroom or laundry room. Otherwise, the crystals may end up absorbing moisture from the air and not last as long. Lastly, make sure your kitty is eating good quality food, since this will make her waste easier to remove from the crystals. Avoid foods high in crude fiber and by-products. In the right home and with the right felines, crystal litter can be a great fit. While more expensive than traditional options, many users find that the cost is well worth it, since it saves so much time and works so well at absorbing odors. If you’ve been thinking about switching out your kitty’s litter, hopefully this review will help. And remember: as long as you’re aware of the pros and cons of crystal litter granules, then trying out this innovative product could lead to some beneficial results for you and your four-legged companion!